It seems TStv really want to fulfill their promised this time around. 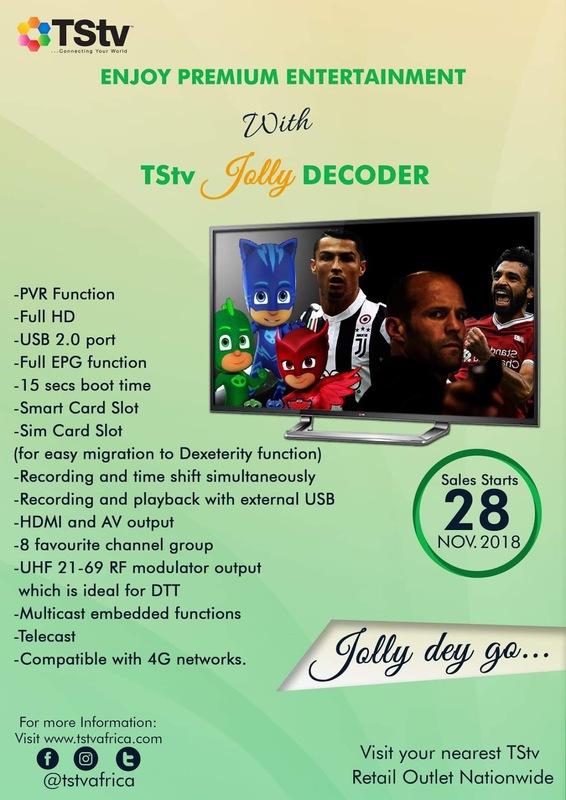 As earlier promised last month, that all channels remain free till the end of November before the official sales begin, TStv will commence nationwide sales of its new decoder (TStv Jolly) beginning from 28th November 2018. NB: TStv channels will be encrypted from 11:50pm of November 27. From the 28th of November, TStv will roll out 62 Premium Entertainment Channels and all will be encrypted. For those who already have a TStv Sassy Decoder, kindly take your decoder to a Dealer's office near you to get it fully activated. 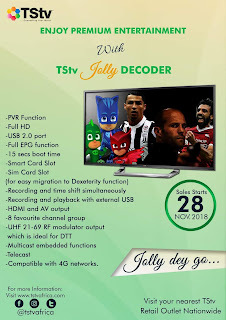 The price has not been announced but I’m guessing it will maintain the same price tag with Sassy Decoder or a slight change since this is not Dexterity Decoder.